Being a musical style that enjoyed its greatest heyday and period of development in the 1970s and 1980s, it is remarkably difficult in 2016 to find a heavy/doom metal band that practices its craft with the same level of conviction and authenticity as its forefathers. 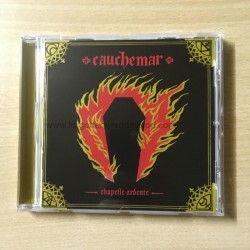 Cauchemar, a French-Canadian quartet of practitioners of this craft, are an exception in an otherwise drowning sea of mostly uninspiring, modern-day, traditional heavy metal bands. Beginning with their debut recording, the “La Vierge Noire” MLP, and continuing with their first full-length album, “Tenebrario,” Cauchemar laid the necessary groundwork for a strong bid to place themselves atop the mantle under which the flames of true heavy metal still burn. With the release of their second album, “Chapelle Ardente,” Cauchemar continues this crusade with the enduring support of Nuclear War Now! Admirers of their previous works will be pleased to find that there has been no seismic shift in the band’s approach to writing and performance. Still present are François Patry’s driving, hook-filled riffs, which are likely to remind one of those written and executed by Alan Jones of the great Pagan Altar. Also familiar is the mysterious, haunting intrigue in the French-language vocals, as performed by Annick Giroux. Indeed, it has been these melancholic but powerful female vocal performances that have given Cauchemar a distinctive flavor which has largely set the band apart from the vast majority of their contemporaries. Giroux’s vocals tend to flourish in middle registers, which are noticeably deeper than most female vocalists, and this quality gives them a discernible fullness that, when combined with just the precise amount of reverb in their production, lends each song an aura of somber allure. On the other hand, there are several subtle but significant developments to be found in this recording that provide evidence of a band whose songwriting and musicianship have evolved. What most sets this album apart from previous Cauchemar recordings is an increased maturity in songwriting and complexity in the compositions. The album as a whole is a bit more dynamic than its predecessor, with greater variation in Patry’s riffs and the song structures overall. Finally, the key addition of an organ in several of the tracks is an appropriately novel complement to Cauchemar’s brand of heavy/doom metal. Recorded in a chapel on a Casavant pipe organ from 1880, this ingredient bears a striking authenticity that could not have been matched with the use of more standard keyboards. All told, each of the aforementioned traits of “Chapelle Ardente,” in combination with the themes explored in the lyrical content, serve to collectively and successfully express the album’s solemn meditations on death and dying, all the while maintaining Cauchemar’s status as a beacon of light in today’s heavy metal scene.